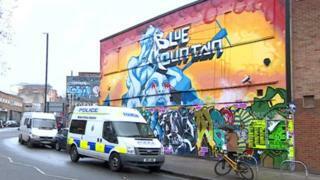 A man who died after an assault in a Bristol nightclub had been stabbed, police have said. Jamal Powell died following a disturbance at the Blue Mountain Club on Moon Street, Stokes Croft, at about 03:00 GMT on Saturday. A post-mortem examination showed the 37-year-old had been stabbed multiple times, Avon and Somerset Police said. Two men, aged 39 and 55, have been arrested on suspicion of murder and are in custody. Det Supt Carolyn Belafonte said anyone who witnessed the incident should contact the force. "If you have footage of the disturbance, or have seen it posted on social media, please get in touch. "Any information, no matter how insignificant you think it might be, could prove to be vital." Mr Powell died in hospital about two hours after the assault. His next of kin have been informed and are being supported by officers. Police said the 39-year-old was arrested at the scene, while the 55-year-old was arrested later. The club remains closed while specialist crime scene investigators continue to examine it for evidence, and police have increased patrols in the area "to provide reassurance".